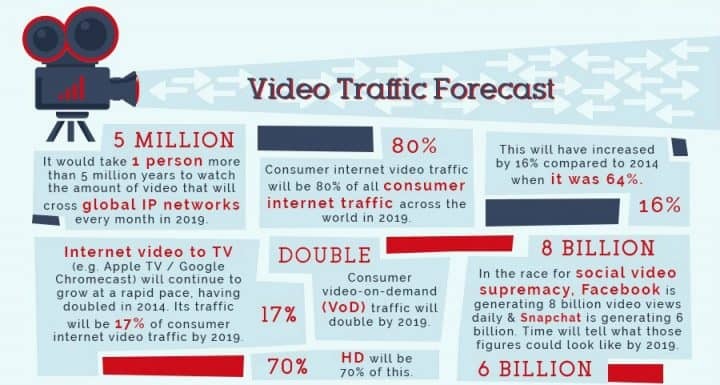 By 2021, 82% of the traffic driven from advertisements will come from video! Compared to other forms of content, videos are versatile, easy to digest, engaging and entertaining. They give consumers a break from the ginormous amount of information found in text online. Videos portray life in motions, giving a deeper sense of what is going on. They appeal to our emotions. If you are a marketer, videos should undoubtedly be the one of the biggest attractions in your promotion toolbox. Producing high-quality video content can be a daunting task. Your videos need to be short, rich in content and deliver value that the audience can feel. Your video has a lot of competition too! It needs to capture and retain the attention of a distracted person. Businesses need to use creativity to meet the growing demand for visual marketing. Most businesses have in-house professionals using Adobe tools to create such videos. However, this process is tedious and time-consuming. Sure, you can use several online tools to create videos. But most of those tools lack varied animation libraries and don’t perform up to expectations. RS Raghavan and Loganathan K decided to help brands create high quality animated videos, in a fraction of the effort, time and cost it was taking them otherwise. That’s when Animaker was born. Animaker is home to a vast collection of animated characters, backgrounds, icons, charts and maps. Animaker’s varied library allows you to create the ideal videos/images for marketing campaigns, business presentations, and even personal projects. Back in 2011, the CEO and Founder of Animaker, Srinivasa Raghavan noticed that many companies are spending a lot of time and money on expensive studios that depend on complicated equipment. He wanted to create a platform that equips companies with an in-house studio and internal creative tools that don’t take up all their revenue. Along with his college mate Loganathan, Raghavan started Bode Animation. Bode Animation was just a team of two developers and one designer when it first started. Raghavan and Loganathan worked together towards developing the team by providing them with the right kind of resources and tools. Today, their team is a 30-employee enterprise. Raghavan’s ever-increasing passion for innovation took Bode Animation on an upward trajectory. In 2014, the startup progressed to a do-it-yourself (DIY) video-making tool, we now know as Animaker. “As leaders, we cannot motivate people; we can only create a context and an environment where people feel motivated. We need to be transparent because, in order to build a ship, we cannot simply order our team to collect wood pieces and report back to us,” says Raghavan. Today, Animaker provides 100+ animated charts, 1000+ animated icons, and 3000+ animated maps. The company has served 1.5M+ people from across the world thus far. They are competing with companies such as Raw Shorts, Video Brewery, Powtoon, and Moovly for a share of the $1.81B digital video software segment. Animaker’s easy integration with YouTube and ability to export videos to channels seamlessly from the platform leave it uniquely placed to capture a lucrative portion of this market, pegged by market research companies to be growing at a CAGR of 10.31%. As most of its competitors, the company runs on a freemium model. Unlike others, the free version allows users to make as many videos as they want of less than 2 minutes. Animaker also allows you to give life to your videos by adding human voice-overs. Whether you want to add a soothing background score or use the ‘text to speech’ converter, Animaker makes it all possible. To catch up with the growing mobile video trend, Animaker has introduced a new tool using which you can create vertically optimized animated videos. These videos fit perfectly into the mobile screen of your audience. The company proudly proclaims that it is completely bootstrapped and has been profitable from day one.